Times New Roman. Simple. I like it. 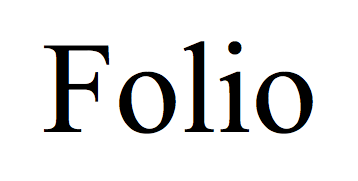 Folio, Skidmore’s oldest student-run literary magazine, is currently accepting submissions for publication on our website (skidmorefolio.tumblr.com) and in our annual end-of-the-year publication. We’re interested in any form of artistic expression, be it writing (poetry, fiction, creative nonfiction, or perhaps some indeterminable genre), photography, art, sheet music, and anything else that involves the creative impulses of Skidmore students! Please send any submissions to folio@skidmore.edu as a separate attachment, along with any information you think we should know about the submission(s). Multiple submissions are both allowed and encouraged! If you have any questions, please email folio@skidmore.edu or jlemay@skidmore.edu. Folio is one of two surviving literary magazines from my freshman year, with BARE being the other (RIP Skidmore Scribe and Palimpsest), so do what you can to keep these two magazines/websites in circulation and send all your artsy junk their way.